Like many actors, Tom Cullen travels through time via the various roles he plays. The Welsh actor jumps from 14th Century France and to 17th Century England in two shows airing this week. 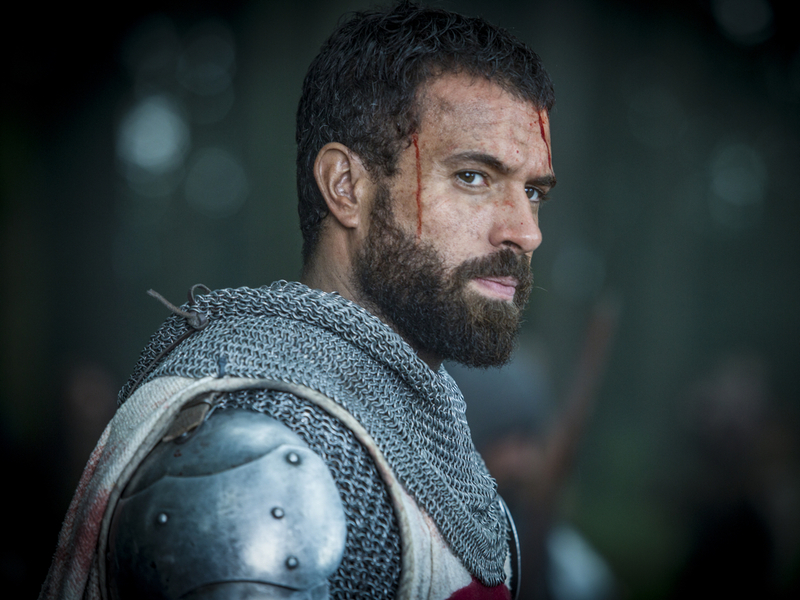 In History’s “Knightfall,” he plays Landry, a Templar Knight charged with finding the Holy Grail years after it was lost during the fall of Acre, the last Templar stronghold in the Middle East. “Knightfall” airs at 10/9c Wednesdays. In “Gunpowder,” Cullen stars as Gay Fawkes, an anarchist who—with a group of provincial English Catholics—planned to blow up the English House of Lords and kill King James I in 1605. HBO airs the three-episode series Dec. 18-20 and on HBO Go. You also can catch Cullen in modern times in “The Five,” a mystery created by author Harlan Coben airing on Netflix. He plays Mark Wells, who faces his past when the DNA of his brother, who went missing 20 years earlier, is found at a crime scene. Cullen says there isn’t much mystery to how he picks a role. “It’s such an actor cliché, so forgive me if it’s something you’ve already heard. But I genuinely love to do stuff that is different from the last thing that I did, and something that really scares me and something that is new,” he said during a recent call with reporters. In “Knightfall” he reunites with two actors with whom he co-starred in “Downton Abbey”—set in yet another time period. Jim Carter, who played butler Mr. Carson in “Downton,” stars as Pope Boniface VIII in “Knightfall.” The Pope wants Cullen’s Landry to find the Holy Grail and eventually lead a Crusade to retake the Holy Lands. Cullen starred as Anthony Gillingham, one of Lady Mary Crawley’s (Michelle Dockery) many suitors, in “Downton.” Anthony’s competition? Charles Blake, who is played by Julian Ovenden. The two actors’ characters are at odds in “Knightfall,” too. Ovenden plays William De Nogaret, scheming advisor to King Philip IV of France (Ed Stoppard) and no fan of the Knights Templar. Cullen’s Landry is leader of the Templars—so you see where that relationship will get complicated. Cullen talked more about the show, his character and the joy of sword fighting. You’re on TV now in different roles. How do you choose a project or pick a role? I think one of the reasons that I wanted to become an actor is because I love to try stuff out. I’m quite a yes person. I just say yes to everything anyway in life—such as new experiences and challenges. I think acting is a kind of extension of that … “Knightfall” was truly a dream come true for me. It’s something that I’ve always dreamt of doing since I was a kid. I grew up on films like “Robin Hood, Prince of Thieves” and “Braveheart” and those films had a huge influence on me as a kid. And so when I read this [“Knightfall”] script, it was like my dreams were coming true. It’s really amazing to be a part of a project like this one. There’s so much that scared me about this role. The size of it and the responsibility of playing a lead in a show as big as this was terrifying. Also, just the physical and emotional commitment that was required to make this show work. If I wasn’t committed 100 percent to the show, it wouldn’t work. They really, really put me through it in the best way possible making sure I became the best Landry I could be. That was a terrifying challenge and terrifying to have to pull off. I was learning new skills like horse riding and fighting. The most terrifying thing for me was that—and this is something that I’ve been dealing with my entire life—I was doing something that I love. I read the script and I wanted it so badly because I thought it was so good. [The idea of not getting it—] that really terrifies me. I come from a poor area of Wales where I’m much more comfortable with rejection than not. And so what terrified me was that I wanted to do it and doing something that you love and that you want is often the scariest thing that you can do because if you fail at it, that’s a big journey to go on. This is the kind of project I’ve always dreamt of being involved in ever since I was a little boy. I grew up in Wales and I grew up next to a castle. That kind of history is really woven into the fabric of my DNA like I think it is in many Europeans’ DNA. And when I was a kid, my dad gave me this wooden sword and shield and I used to go up there with my mate and we just used to run around pretending to be knights and warriors. And I think that the older we get the more baggage we carry. I know that I spent a lot of time pining after that kind of innocence. So this job really opened up the gateway to accessing me as a kid again; it felt like every single day I had little Tom next to me swinging a wooden sword around with his mates in a castle in Wales. That was my favorite thing about the job; being able to have as much fun as I had while filming this show and I loved it. Did you have to do any extra physical training? In drama school in the UK we do a lot of fight training. I’d done a lot of sword training prior and I found that I had the propensity for killing people, ironically. So I’d actually done extra exams and had some practice while studying in drama school but that was about eight years ago. I hadn’t swung a sword in about eight years, so it was all very new in many respects. An amazing Frenchman, Cédric Proust, led the stunt team. He is a top stunt man and fight choreographer. He really put us through it and we had a great swordsman called Roman. The entire team wanted us to be at a very, very high level. So every day on set they would drill us and I did about three months of physical training beforehand to get myself and my body ready for the fighting portion of my character and the series. We also did a two-and-a-half week boot camp where we would walk in the morning and do some circuit training and then do fighting in the afternoon. Later, we’d go horse riding and do some more sword training and then we would go to the gym. When it came to the actual filming—because there were a lot of fight scenes, I was filming 14 hours a day doing scene work and then I’d have to do my fight training either on my lunch breaks or on the weekends. Any kind of [free] second in the day that I did have I would fill it by going up to the stables and ride. Working on “Knightfall” was a full-on experience because the team wanted it to look authentic and real, and when you watch the fights they are absolutely incredible. I’m so proud of all of the actors who’ve participated in the battles because we’ve really done a great job and the stunt guys have really trained us well and they’re epic battles and muddy and gruesome. And they feel very real. There is an incredible battle sequence in the final episode which is the biggest thing I’ve ever been involved in. We had 400 guys on a battlefield fighting for about two weeks. And it’s epic and amazing. And the real geek, nerd in me—because I am one—just can’t believe that I’m in it. I’m extremely proud of it. What non-physical preparation did you do—reading and research? Whenever I have done a historical piece, it’s imperative to bathe yourself in as much literature to understand the world as much as possible, so that when you get onto the set, the world is just vibrating inside you. So I wanted to know as much about the crusades and about the politics at the time. Not just the politics in Europe or in the Middle East, but also Mongolian politics because they had a huge influence. And so you just need to immerse yourself in the world and know everything that these men would have known … and where they are at this point and what drives these men and women to do the things that they do. I think that’s something that you have to do, otherwise it’s just lazy and in a way unforgivable because at that point that’s where you make mistakes. And you take history for granted and history should never be taken for granted because it’s essential for us furthering ourselves as a society and as a culture, because the one thing that history teaches us is that it’s cyclical. And so yes, I read a lot and we had a fantastic historian on set. His name is Dan Jones. He’s just released an amazing book that you must read called “The Templars,” which is on the New York Times Bestsellers’ List; it’s brilliant. He was on hand at all times feeding into us and making sure that what we were portraying was as accurate as possible. So anything that would come up in the script that we didn’t know, we would use him as a source of knowledge and he would say, “Go and read this, go and read that,” or just tell us because he’s a real fountain of knowledge. And that wasn’t just the access that put me in the world of the Knights Templar. How does religion factor into “Knightfall,” and what do you think the show has to say about our times today? The one thing that history will always do is prove itself cyclical and that human beings have very short memories and we forget very quickly what we’ve already been through. And we tend to make the same mistakes. I think it’s really important to remind ourselves of those mistakes. And of course, “Knightfall” is a show about the Templars. … I think the show touches on what faith is and how faith can be manipulated to one’s own needs and how faith is often used for political games—which is something that has nothing to do with religion. And the Holy Grail in our show is used as a pivot of power. People circle around it and use it in order to gain political favor. And that for me is really a very interesting world to live in. It doesn’t pit religion against religion, but it talks about how religion can be manipulated to man’s want and need for power. Themes in “Knightfall” include faith, duty, honor and revenge. Do you see any one theme that will resonate with viewers the most and keep them coming back for more? You can look at the show and say, “Oh, this is about guys swinging swords…” But the show is so much more than that. The show is about politics. We have a lot of stuff that takes place in the French Court at the time, dissecting and breaking down the politics and the machinations of political interplay, which I just love that kind of stuff. And it has a fantastic central spine through the show: an amazing love story. I’m surprised at how strong and moving that story was as we were filming it. And it kind of grew into this thing that we had no idea it would become. The show talks about revenge and betrayal, brotherhood, loyalty, faith, humanity and mortality. And I think that it raises really big questions about who we are whilst at the same time being really kind of fun and entertaining. So that takes you on a really wild journey. And so I truly believe the show has something for everybody. I think that it is by no means a gendered show. I think that women would love it as much as men will love it and that is something I’m really proud of, too. It has fantastic, strong female characters. They are actually probably stronger than all of the male characters and they’re just as complex and rich as the male counterparts, and it’s very moving. I’ve watched the last episode three or four times now and I’ve shed many tears every single time. It’s a great rollercoaster. What besides the sword fighting do you like about the medieval time period? I’ve always been obsessed with the medieval time period because I think it’s a time that we can look back on and learn from. Actually, 800 years isn’t that long ago; it is the time really when the world that we live in today was created and formulated. We’re still feeling the repercussions of the actions and choices the people made in the medieval period today. It’s also a period that is grimy and dirty and dangerous. The line between life and death is so thin, it’s really interesting to learn about. … If you have a lifespan of 35 years, every choice you make is loaded. I think that the world of the medieval period is one of very high octane and people making life and death choices every single day. And that for me is an exhilarating period of time in which to make a drama. How do you draw on your own life to play the part of Landry? I’ve had some experiences personally that I put it into Landry, but not many. … The themes that were very resonant with me in the show, that resonated with me as a reader and as a viewer and as an actor, are ones of brotherhood and loyalty, love and lust, and denying one’s own happiness, complexity in relationships with a father and feelings of abandonment. All of that stuff really resonated with me. Do you think because Landry became a Templar so young, he is able to rebel and enter a relationship? I think that when we first meet Landry he is 20. And he is brash and young; he is a maverick, incredibly cocky and is kind of emboldened by the fact that he has God on his side. He thinks he’s invincible, which I think a lot of 20-year-olds think, regardless of whether they have God on their side or not. I know I certainly felt like that. His entire life flipped upside down when they lost Acre, the last Templar stronghold in the Holy Land, and they lose the Holy Grail. And so we flash forward 15 years. When you’ve been brought up as a warrior, and that’s all you know, everything you know, it’s a tough reality to deal with. And so he’s like a caged animal, unable to fulfill what he thinks is his only purpose and duty, which is to fight. He is this very, very complex, pulled apart guy in Episode 1. He is battling with his humanity and he is secular yet he is also still mentally devout. He is very loyal to his brothers, his family yet he is lying to them. He is having an affair with a woman yet he is a monk. He is the bravest, most fearless warrior, yet he’s starting to feel a sense of his own mortality. And I think that’s why he kind of falls in love with this woman. It’s not that he’s doubting God or that he’s doubting the Templars or religion, but that he’s doubting himself. He is in a conflict, in a battle with himself, which are the stories that I love to watch—where your hero is so full of contradiction and [inner] battle and personal complications. And throughout the first season, we see him work through that and battle through that and try and find out who he really is. And it’s an awesome journey for me to play and to take viewers on.